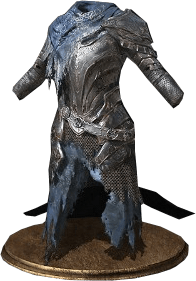 Wolf Knight Armor is a Chest Armor Piece in Dark Souls 3. It is part of the Wolf Knight Set. Armor of a knight tainted by the dark of the Abyss. The twilight blue tassel is damp, and will ever remain so. A vanquished knight left behind only wolf's blood, and legacy of duty. The Undead Legion of Farron was formed to bear his torch, and the armor of these Abyss Watchers suggests their own eventual end. Buy from Shrine Handmaid in Untended Graves for 16000 souls. 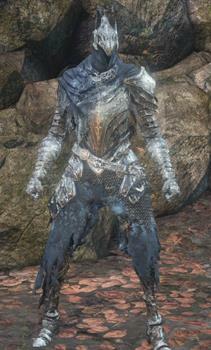 If you didn't collect the Souls of the Great Lords to get to the Consumed King's Garden, this armor is only sold by the Shrine Handmaid after you kill the Abyss Watchers. Artorias is tied to The Abyss Watchers of DS3. He may also be tied to the Hunters of Bloodborne - see article. Reason why it is seen so often is not because it looks good. Reason is it doesn&apos;t weight much...and looks good. Doesn&apos;t really have the best stats, but damn this armor looks so sick. Screw it, I&apos;m wearing it! Is anybody else having the problem where you&apos;re character&apos;s arms clip out of the armor? Yo I killed the vendor thinking I could buy it from the other lady. Is thereally another way to get it? Go through the doors of when u killed him and there will be another old lady to sell you the armor once you reach the (dark version) of the firelink shrine.